I was trying to price pressure cookers on Craigslist so I could find how much I should sell the ones I had for. While looking, there was a post for a moving sale that listed pressure cookers and fishing gear. 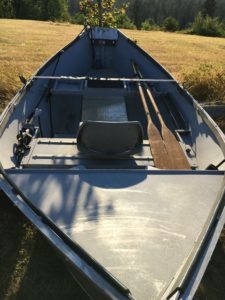 But one of the images was of an aluminum drift boat. I clicked on it, inspected the picture of the boat, and decided that I should write the owner. What shape it was in, price, etc. He wrote back with a price and few other details. After several back and forth messages (in which he answered roughly a third of my questions), I asked to come take a look that evening. He said sure. Michelle and I drove up to Camas to check out the boat because the girls were at the pool watching a movie (hedonism!). It was old, but in relatively good shape, and the owner was a nice enough guy. We agreed to buy it, but had to settle on payment arrangements first. Well, two weeks later, payment was made, and we picked up the boat on a Friday evening. There was a hornet’s nest in the tongue of the trailer, but he didn’t seem too concerned. He was wearing pants though. We towed it home, chatted with the neighbors who all thought it was cool, then started to prioritize the weekend. Saturday I picked up a second seat for the front and a not-so universal swivel mount. 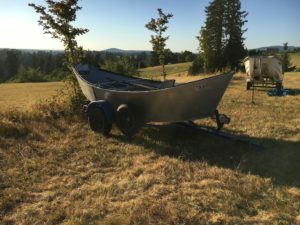 It took a while to install it, but we got the boat ready and took it out to Henry Hagg Lake for a pleasure cruise (and to confirm that it would float.) The lake was way down, and the trailer was squirrelly to back down the ramp. Immediately as we launched, MG got stung on the ear by a bee or something. The wind and wake made for chaos, along with an amped up dog and MG wailing in pain. We rowed across the lake and beached on a mud slope so we could run the dog and swim. The girls immediately dove in, and I discovered that there was a second hornet’s nest under the anchor mount. I smashed it out and covered it in mud and we kept playing. We then rowed up the lake arm to the shallower part where there were fewer people (and less wind) and anchored and played for a bit. 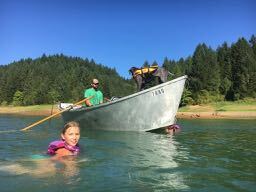 We ran the dog, swam in the lake, and took turns in the float tube until it was time to head back to town. We rowed back to the launch, slowly, because of the wind and wake, and hooked up to the dock while I ran up to get the car and trailer. When I got there, I found a third wasp nest in the spare tire. No time, I left it and rolled down pass the tournament bass boats to pick up our new (old) boat. We got the boat on the trailer despite some chaos and pulled up to pick up the mess so we could drive. I think we all agree that we need to work on launch and landing protocol so that we’re not all yelling at each other, but no one (except MG with the sting) got hurt. The day after, Chris, Michelle and I took it down the Kalama River in Washington to try out my rowing skills. 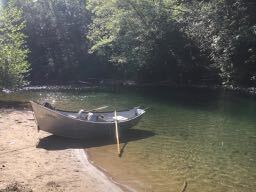 The water was low, the fishing bad, and we had to portage a few times. But we made it, and there was only one harrowing part. Well, except for the launch. We launched at Slab Hole and there was a large sand bar at the bottom of the ramp that prevented us from backing the boat in to the water. Instead, we tied a rope to the bow (and trailer) and had to push it off the trailer, where it dropped down in to the water. My ring got caught on the bow, and as the boat fell, I was pulled with it. Fortunately, my ring popped off before I went over, though it hurt quite a bit. A week later and my entire hand is still sore. The one harrowing part was the approach to the tree hole and bend below Mahaffrey’s. The river is so low that the current puts you in a chute right up against the steep rock bank. The chute was a little wider than the boat, and it was difficult to row since the oars were on the bank. I was able to turn sideways to pull away, but right as a mid-current rock arrived. I asked the passengers to leave left to help slide over the rock, and they both leaned right, making sure we got a solid chine-to-rock collision. Nice work team. We survived though, and subsequently survived the experience of having to do a 23 point turn because some jackass parked in the boat turn around. All in all, it was a great first weekend with the boat. We have a better understanding of the needs, the boat (which rides quite high, I’m happy to report). We did a few portages, but it was great and I’m excited to row again. This July, the family loaded up in the camper for an epic journey to visit new parts of Oregon and to visit the legendary Redwoods. We’d been planning for 5 months, so we had a pretty good idea of our itinerary. We decided to shorten the initial drive by stopping off at Lost Creek Lake, where we stayed at the state park over the 4th of July weekend. The reservoir was down considerably, and the campground wasn’t very close to the water. However, we did rent a pontoon one of the afternoons and ventured up-river to avoid the high-wake from water skiers and lake jerks. East of the bridge is a “no wake” zone, so we tried to quickly make our way to safety when a combination of large cross-wakes and a rather sudden deceleration plunged the bow, Michelle, and the girls briefly under water. It was a scary moment as the front of the boat briefly submerged. We recovered and sped to the safety of the no wake zone. Once we reached the no wake zone, the girls jumped in and swam to a nearby sandy-looking shore. We tied the pontoon to a log and swam and played on the shore. The shore was an interesting mix of ash, pumice, and charcoal. It took a bit to realize that we were playing in an old volcanic eruption. How cool! After a while, we trolled up the lake, catching and releasing some trout, and pulled out again to light some sparklers (it was the 4th, after all), swam, had dinner, then headed back in as the sun was setting. It was a wonderful voyage. Each morning, I would get up between 5am and 6am and drive down below the dam and fish hatchery to try my luck on the Rogue. It’s the 4th major Oregon river I’ve tried, and for once, there were lots of other people around angling for some early Summer run Chinook or late Spring steelhead. I didn’t have any luck besides an impressive strike where the fish leaped over a foot in to the air before ditching the spoon. But I didn’t see anyone else having luck either. And right below the hatcher, there were people standing shoulder-to-shoulder doing this odd jerking technique which I learned from a fly fisherman is called “flossing.” He shuns the practice, which is akin to just snagging fish. Odd. On the 4th of July, there was also a kid-focused parade. The girls didn’t have bikes, but they loaded up their scooters with flags, garland, and tried to keep up with the bike parade for a while. How often do you get to follow a giant beaver around a campground? On the 5th, we continued up the Rogue towards Crater Lake. We stopped at the Rogue River Gorge, a cool cut in the basalt near Farewell Bend CG. We learned more about the Mt. Mazama eruption that deposited all the pumice, ash, and charcoal that we’d been playing in the day before. Then we continued up to Crater Lake to take in the impressiveness of its blue. I insisted that we hike down to the lake, which was busy and dusty (who knew everyone else would be out on the holiday too?). We soaked our feet at the bottom for a bit, avoiding the inevitable climb back up until MG needed to pee. Michelle took her to the outhouses by the dock, but they were so incredibly dirty and gross that they just decided to hike up. Ella and I caught up with them less than two minutes later because Michelle had decided to hold MG over the edge of the trail so that she could pee down the cliff. It would have worked fine if she hadn’t lost her shoe, which fell about 15 feet down the steep slope. I was able to rescue the shoe, and then we hiked on, listening to MG complain about how much pain she was in for about half the climb. Finally, we picked her up and carried her. Ella was a champ though, and both girls spirits were reignited when we had early appetizers at the Crater Lake Lodge. 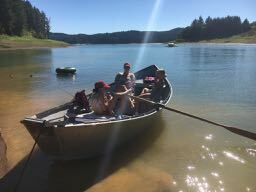 After the lodge, we hit up Lost Creek Lake for one last swim before journeying on to the Redwoods. Since the Redwoods are a primitive site, we filled up the tanks with water and took a last shower. On the way south, we stopped by the Oregon Vortex. It was … interesting. Wrapping up a few more details, we stopped at a Walmart in Grants Pass to get more mouth-numbing medicine for Ella (who was being a total trooper with her brand new braces), some groceries, and a half-rack of Sierra Nevada Torpedo (which we left on the camper battery and drove for a couple miles around Grants Pass). The road to the Redwoods was very dry, and we saw a dead black bear off the highway outside Cave Junction. The road gets very interesting as you cross the boarder in to California, but the last few miles were exciting as we wound our way down the Smith River.